In the last issue we saw that the depleted Rogues went up against Man-Bat and Poison Ivy when Mirror Master’s abilities went off-kilter and deposited the team into Gotham after escaping from Metropolis where they had gone up against Parasite and some wannabe archer villain. In this issue, we see the Rogues go up against a whole host of different villains. We start off with the duo of Mr. Freeze and Clayface. Then we get Black Mask and his gang of animal-mask stooges, and then we go on to see the Royal Flush Gang, which was a real highlight of the issue. Aside from the fact that once again an issue of the series is just all about villains vs villains with very little plot development, what I liked was that Mirror Master was really developed into a great character. He’s taken over for Captain Cold as the leader of the Rogues and he’s been doing his best to keep the team together and focused on getting back to Central City, even though things haven’t really worked out that way. Matters are not helped by the second fact that the Crime Syndicate has put a bounty on their heads and thus all the supervillains of the DC universe are after them right now, excepting those who are engaged elsewhere. But Brian doesn’t stop with just Mirror Master. We see some nice development for Trickster as well, who’s been rather underused in the previous issues but gets a great ten seconds of fame in this issue. The same goes for Heatwave, who has been built up as another character of interest and gets his own moment to shine here, something more emotional and more moving than anything else. Perhaps only Mirror Master has seen that kind of emotional development since the two villains have been with Captain Cold for a long time and are closer friends to him and to each other than any of the other members of the Rogues. The Royal Flush Gang get a great outing as well. They begin this issue and they end it as well. Brian only teases them at both ends of the narrative, but I love what he did with them here. He made them come across as competent villains who really do have a shot at bringing the Rogues in. No goofiness at all. And on that note, I thought that Black Mask was far too incidental and irrelevant to the issue. His parts could easily have been cut and given over to either the Mr. Freeze and Clayface duo or to the Royal Flush Gang. The story would have been the better for it. Black Mask was just too… flat, whereas the others were far better developed. One final note on the story: how does all of this tie in to Peter J. Tomasi’s Arkham War? The villains of Gotham are all supposed to be fighting against each other for control of the city and yet they all have time to go take care of the Rogues? That doesn’t quite jive with me. Then again, I haven’t really read the most recent issue, so I could be wrong, but the crossover doesn’t really help. The pencils are, once again, handled by both Scott Hepburn and Andre Coelho. I’m not really sure why the issue necessitates two pencillers. The switches are somewhat random, since its not like the artists are handling distinct halves of the issue, but a few pages here, a few pages there. Pencilling inconsistencies aside, I loved the artwork. Particularly the Royal Flush Gang, who are drawn by Scott. Andre handles most of the middle portion and thus gets to do the most action-packed sequences and those pages are also very excellent. Nick Filardi’s colours make the artwork shine in every single page and there is an overall “warm” feeling to the artwork. There’s no inherent grimness to the issue. The artwork matches the tone and mood of the script, and that’s pretty damn important I feel. And finally, I love that cover by Declan Shalvy and Jordie Bellaire. They’ve turned out some great covers previously and this is another feather in their collective cap. I’d love for this duo to do a whole lot more covers for DC. I love their work. Overall, Forever Evil: Rogues Rebellion #4 is a good issue, but I wish that there was more actual relevance to the events of Forever Evil and that the Rogues were doing something to actually combat the Crime Syndicate rather than being on the run all the time. More Forever Evil: #1, #2, #3, #4; (Arkham War) #1, #2; (Rogues Rebellion) #1, #2, #3. Posted on January 18, 2014, in Comics Reviews, Review Central and tagged Andre Coelho, Black Mask, Brian Buccellato, Captain Cold, Clayface, Comics, Crime Syndicate, DC Comics, Declan Shalvey, Forever Evil, Forever Evil: Rogues Rebellion, Gotham, Jordie Bellaire, Mr. 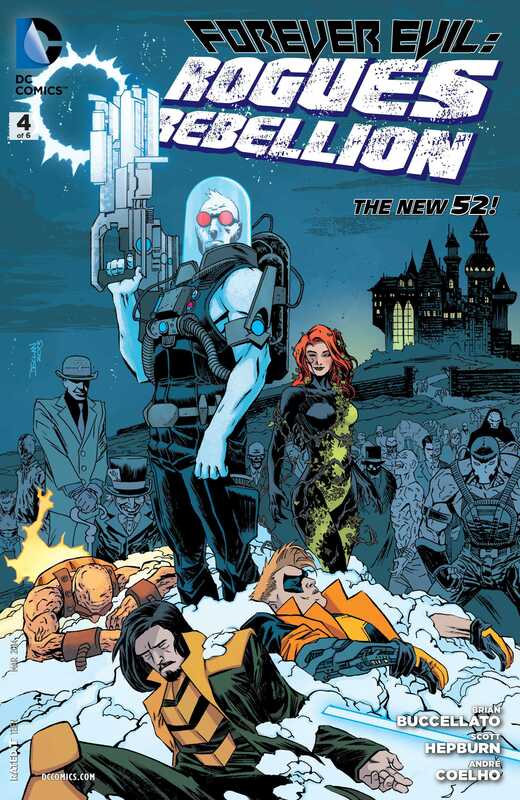 Freeze, New 52, Nick Filardi, Review, Review Central, Rogues, Rogues Rebellion, Royal Flush Gang, Scott Hepburn, Supervillains, The Flash, Weather Wizard. Bookmark the permalink. 3 Comments.